The clear sprue is all new as well. It includes three Erla canopies and two forward canopies. You'll only use on of each though. The photo etch set is pre-painted fret with all the items such as seatbelts, shoulder harness and instrument panel. Also included is a set of masks. As usual the construction begins in the cockpit. There is a fair amount of photo etch inside the cockpit. I painted my cockpit with Tamiya German Grey. Then I used Light Grey artist oils and Model Master Metallizer magnesium to put some wear in the cockpit. A wash of Lamp Black artist oils thinned with turpenoid added depth to the cockpit. A little bit of AK pigments was added to the floor to add some dirty to the cockpit. Bringing the fuselage halves together proved that the fit was exceptional. I always have an issue with the saddle panel in front of the canopy and this kit proved no different. I'm sure it is me. The rest of the fuselage was good. The upper cowling fit perfectly. I left off the supercharger intake until later in the build. The horizontal stabilizers, tail and rudder fit perfectly. The wings, while new, fit as well as the previous releases, perfectly. I add the upper inboard flaps to the upper wings now while I can clamp them into place. This makes sure that they fit and are the same angle. While at it I do the same thing to the lower flaps on the oil cooler. The fit of the wings to the fuselage was slightly less than perfect. Eduard for some reason put the seam not on a panel line so this needs to be filled. A little bit of superglue and accelerator filled the seam nicely. There are some fasteners on the belly, in particular on the fuselage piece, that were shallow and disappeared with a few swipes of a sanding stick. These were restored with a beading tool. I also had to extend the panel line that is on the wing part to the first panel line since it is not on the fuselage side of the seam. The oil coolers were added. I drilled a small hole in the center of each cooler. Then I inserted a wire to replicate the stiffeners and actuators. Superglue was added over the hole and when dried were sanded flush. The landing gear were added now to protect the flaps. Then it was time to add the front canopy. Don't forget to add the gunsight. I replaced my clear part of the gunsight with some acetate. The masks make masking the canopy very easy. I taped off the canopy opening and painted the canopy with Tamiya German Grey to match the interior. Then the entire model was wiped down with Testor's Plastic Prep. The model was then sprayed with Alclad Grey primer. Areas that needed it were touched up and re-primed. I pre-shaded the bottom with Tamiya Dark Grey prior to adding Mr. Paint RLM 75 to the bottom. While I had the RLM 75 in the airbrush I pre-shaded the top in that color. The bottom was then masked off with Tamiya tape. The upper surface was painted in Model Master Light Grey FS-36495. I used the wing tips and cut out masks for the red area on the wing tips. Then the areas that were to be painted in the Gunze Wine Red were masked off and sprayed. When the masks were removed, I had lots of bleed and overspray. All my fault. I needed to touch up a bunch of areas and some overspray. So, it was back to masking, then repriming those areas with Alclad Grey, which is actually really close to FS36495, to even out the finish and the RLM 75 and Light Grey were resprayed. There were some other areas that needed to be touched up in the Wine Red. So, what I thought was an easy paint scheme ended up being quite labor intensive. A coat of Tamiya Clear thinned with Gunze Mr. Leveling Thinner prepped the model for the decals. The Eduard decals are very thin and stick very well. They are perfectly in register. Because they are sticky it is imperative that you flood the area with water and move the decals carefully in place. This is particularly important on the huge wing markings. Once everything was in place, I used Solvaset to set everything in place. The decal film literally disappeared. Once they were set, I sealed them with an Alclad Flat. They were so thin that was all that was needed. After drying thoroughly, it was time to start the weathering process. I start my weathering with a light wash with burnt umber artist oils thinned with turpenoid. This dirtied up the airplane slightly. This is followed up by fading the upper surfaces with some dots of Titanium Buff, Titanium White and very few spots of burnt umber artist oils near the exhausts. Then a damp brush of turpenoid was swirled around then dragged in the direction of airflow over the wings and vertically down on the fuselage. Next up was a slight addition to the exhaust stains with some very thinned Tamiya Buff. I start at the exhausts and then pull it aft and away from the model, so it is not a very defined exhaust streak. While I had the buff loaded in the airbrush, I also added more volume to the streaking. I kept it light. The exhausts are built up with Mig Pigments Russian Earth and finally Black Smoke. I keep the black just near the exhausts. I also add some near the guns. Now it is time to add the scratches and chipping. I use a silver ink pad and a sponge to get some unique patterns. I also use a silver pencil to put specific scratches. Artist oils, burnt umber, burnt sienna and lamp black were streaked on the belly of the airplane. The canopy masks were removed, and they worked like they were designed to do. Antennas were added. I needed to add the wheels. Strangely, Eduard provides the wheels, but the back of the wheel does not have a hole for the strut axle. I don't know why this happened. So, I didn't feel like finding the center to drill the whole thing, so I went to BarracudaCast and used a set of their wheels. I think the BarracudaCast wheels were superior in overall detail. The brakes and the ribs on the wheel were much better than the kit offerings. They were painted up in Lifelike Colors Tire Black and the rims were done up in RLM 75. This was different to me. The wheels were added with superglue and the flat spots placed on the ground. Since these aircraft were used mainly off airfields, I painted the circumference a light grey and dry brushed the rims with a little metallic. Then a little AK Airfield Dust was added to the tire. The canopy was built up and attached as was an EZ Line antenna. Other small items were put in place. The final piece was the prop and the model was done. I have loved building everyone of these Eduard Bf-109 kits. This Avia S-99 is no different. Is it perfect? 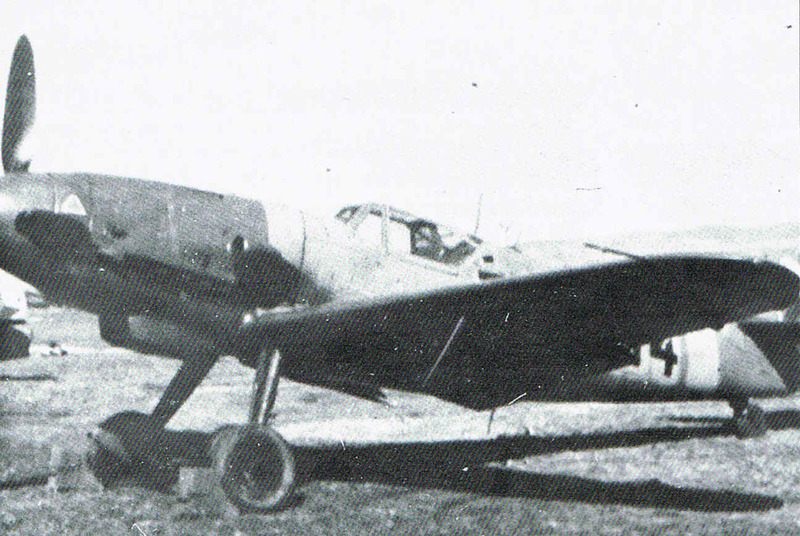 No, but it is the finest kit of the Bf-109G-10 out there. I would have loved for Eduard to have the wing to fuselage join on a panel line instead of the V, but it is easy enough to fill and scribe. The minor variations of the different G-10s are captured very nicely in these kits. I can see myself building more of these kits. The Avia, or Bf-109G-10 WNF/Diana, kit is a fun build and the unique red nose and leading edge of the wings, along with the huge red and white letters, makes this a very colorful addition to my collection. Another winner from Eduard. Bring on the other G-10s and the K-4. These late war 109s have a variety of mis-matched colors and panels. It is a great time to be a Luftwaffe modeler. Thanks to Eduard and IPMS/USA for the review copy. You can obtain yours by contacting them at www.eduard.com or at your local hobby shop or online retailer.